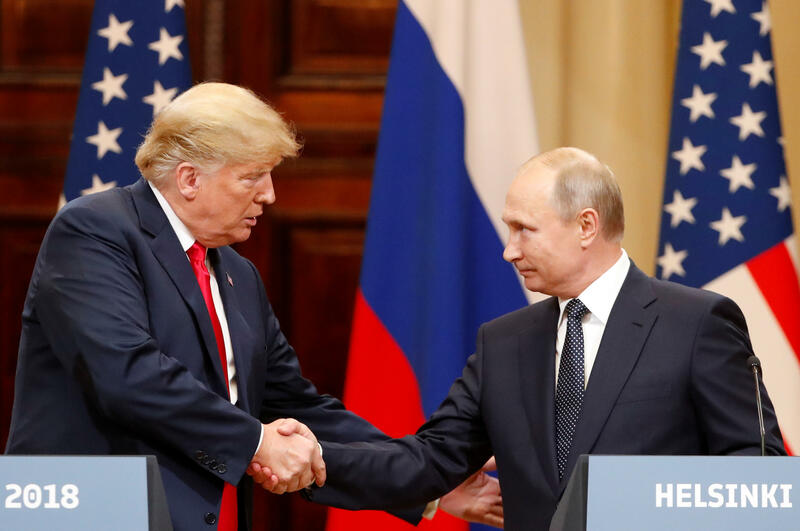 Only a third of Americans (32 percent) approve of the way Donald Trump handled his summit in Helsinki with Russian President Vladimir Putin, a CBS News poll shows. Sixty-eight percent of Republicans approve. Most Americans (70 percent) believe U.S. intelligence assessments that Russia interfered in the elections, though Republicans are more skeptical. Just half say they believe U.S. intelligence, while nine in ten Democrats do. More Americans see President Trump as too friendly toward Russia than they did last year. This is largely due to an increase in the number of Democrats and independents who say so. More than 3 in 4 Republicans think the President has the right balance. Thirty-nine percent of Americans report feeling less confident after the summit about Mr. Trump standing up for U.S. interests, though much of that comes from Democrats; Republicans say they are more confident or unchanged. Republicans hold relatively more positive views of Russia than Democrats do, as has been the case since Donald Trump was elected. More Republicans call Russia at least friendly or an ally to the U.S. compared to Americans overall. Looking ahead, a majority of Americans overall (61 percent) express at least some concern about Russia interfering in the 2018 elections, though Republicans express far lower levels of concern, while most Democrats are very concerned. Americans are mixed on how to approach Russia going forward, with slightly more in favor of diplomatic pressure over dialogue and cooperation. On the economic front back home, 67 percent of Americans think the condition of the economy is good, including one-in-five who say it is very good. These numbers have changed little over the past year. Most Americans across the political spectrum hold positive views of the European Union, calling those nations allies or friendly to the U.S. This poll was conducted by telephone July 17-18, 2018 among a random sample of 1,007 adults nationwide. Data collection was conducted on behalf of CBS News by SSRS of Glen Mills, Pa. Phone numbers were dialed from samples of both standard land-line and cellphones. The poll employed a random digit dial methodology. For the landline sample, a respondent was randomly selected from all adults in the household. For the cell sample, interviews were conducted with the person who answered the phone. Interviews were conducted in English and Spanish using live interviewers. The data have been weighted to reflect U.S. Census figures on demographic variables. The error due to sampling for results based on the entire sample could be plus or minus four percentage points. The error for subgroups may be higher and is available by request. The margin of error includes the effects of standard weighting procedures which enlarge sampling error slightly. This poll release conforms to the Standards of Disclosure of the National Council on Public Polls.